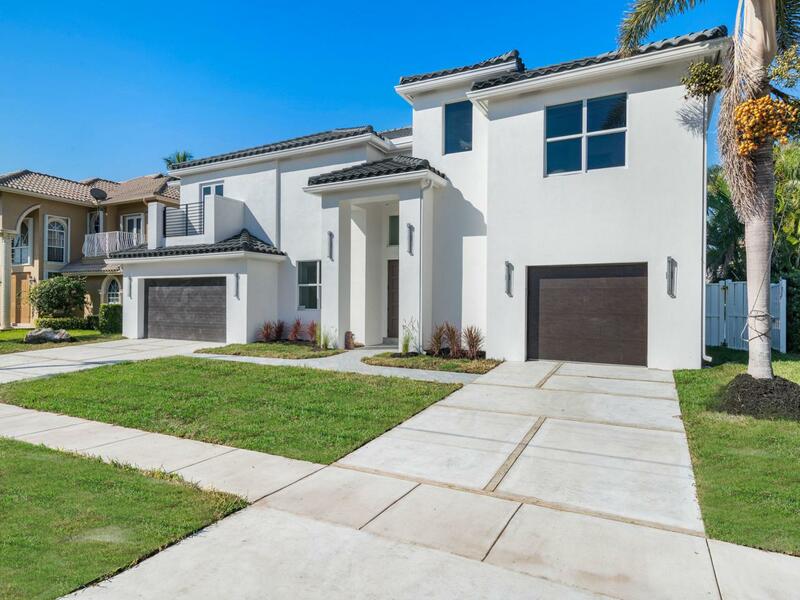 Enjoy Modern Waterfront Living in Lighthouse Point! This spectacular 6 bedroom, 5.5 bath, 3 car garage, 4,600 square foot, two-story, home offers you the best of South Florida waterfront living. Located in a boater's paradise, this home features sensational sunsets and incredible views across your waterfront dock which leads you to the Intracoastal Waterway. The deep-water dock has no fixed bridges and can accommodate up to a 70' boat and provides an easy and relaxing short ride to the open ocean. The grand two-story entrance foyer sets the stage and welcomes you to an open floor plan bathed in warm natural light. Primary living and entertaining spaces are located on the main level, which offers water views throughout.In the kitchen, the use of white marble and quartz reflects a sleek modern aesthetic; it also boasts a large island, Miele appliances, European style cabinetry, polished chrome fixtures, and a charming breakfast table, all overlooking the water. Spectacular open water views off the living areas. A master retreat with a morning bar, his and her walk-in closets, a dressing area, and beautiful water views, is located on the second level. The en-suite bathroom will make you feel like you are in a 5-star spa. Luxurious finishes are accentuated, from the double floating vanity, to the open Wet Room concept featuring a stone tub and an oversized dual-head shower system. If luxury, lifestyle, and modern amenities are what you want at an incredible price, this is the estate for you. Just south a few miles from Palm Beach County and a short drive to Fort Lauderdale, this location cannot be beat. This is the ultimate in waterfront estate living at a price far below anything remotely comparable in the south Florida area. Listing provided courtesy of Casa Bella Real Estate.